Even though 4K may be hot right now, 2560x1440 QHD monitors still give you a ton of screen real estate and work with a wider variety of computers. So if you’re looking to upgrade your workspace, $170 is a terrific price for a WQHD IPS panel, let alone one from a top-tier manufacturer like Acer. Logitech’s K780 keyboard can connect to essentially any modern computing device over either Bluetooth or with a USB wireless dongle, including smartphones, tablets, home theater PCs, game consoles, and smart TVs. But the same could be said for a lot of wireless keyboards, so what’s so great about this one? The K780 can stay paired to three devices at once, and switch between them at the touch of a button, so you won’t have to go through a cumbersome pairing process every time you want to switch from controlling your smart TV to your Xbox One. It’ll also run for up to two years on a pair of included AAA batteries, and even has a stand built right in for phones and tablets. $60 is the best price Amazon’s ever listed on this model, so you never need to type in your Netflix password with a joystick ever again. You know the little charging brick that came with your phone? Throw it out, and spend $5 on this replacement from Aukey (with code AUCHARGE). It’s only slightly larger than Apple’s standard iPhone charger, but it includes two ports, folding prongs, and 2.4A of current (shared between the ports) to charge your devices faster. Want to try your hands at digital drawing on a starving artist’s budget? Wacom’s Intuos graphics tablet and pen is down to an all-time-low $62 for Prime members right now. This isn’t the flagship in Wacom’s lineup, but it features 1,024 levels of pressure sensitivity, and it also doubles as a giant multitouch trackpad that you can use with your fingers. Breville’s reader-favorite Smart Ovens almost never go on sale, but Amazon’s offering a rare $50 discount today on the most popular model. I got one of these as a wedding gift last year, and it’s every bit as good as advertised. In addition to the obvious-use cases like toasting bread or cooking a frozen pizza, I basically use it as my “real” oven for any recipe I can fit, since it preheats significantly faster than a full-sized oven, and doesn’t heat up the entire house. The Alexa-powered Ecobee4 smart thermostat is shipping soon, and that means bargain hunters can score a big discount on the still-excellent Ecobee3. If you aren’t familiar, this thermostat has basically all the features you’d expect from, say, a Nest thermostat, but includes a remote temperature sensor that gives it a fuller picture of your home. If co-workers have been stealing your food out of the office fridge, or you just want to keep a couple drinks cold at the beach, this flexible lunch box is basically made out of ice packs. Just freeze it overnight, and it’ll keep your food and drinks chilled for up to 10 hours. Most of the Sonicare deals we see are on the powerful Flexcare and the more budget-friendly Essence. But today, Amazon’s Gold Box is about keeping your pearly whites, well, pearly white. Pick up a Philips Sonicare Healthy White for $60, today only, and maybe impress your dentist at your next checkup. Score 15 iconic and creepy films in one attractive box. 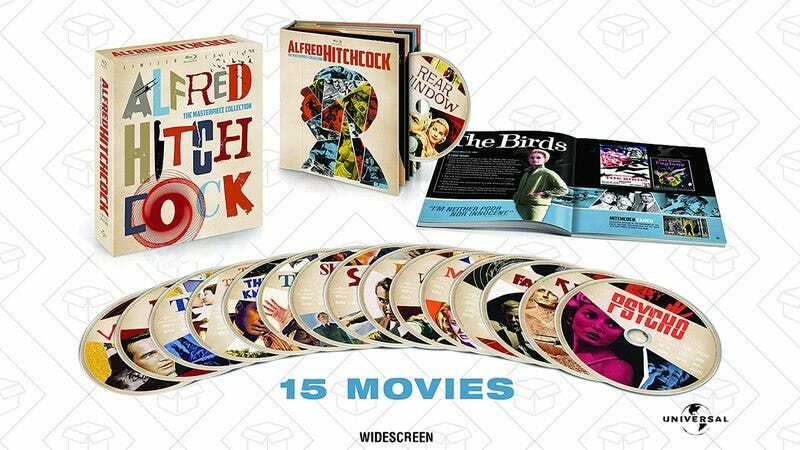 $72 is the lowest price Amazon’s ever offered on the Alfred Hitchcock Masterpiece Collection. This Scorsese triple-feature Blu-ray includes The Departed, Goodfellas, and The Aviator, all for $10. You could say it’s the way of the future… of your movie nights.